What a great adventure at Great Adventure. You might even say it was a zoo. Using a Wawa discount coupon, we got in for half of what a concert ticket usually costs. In addition, you got admission to the park, the rides, attractions and shows. This meant dolphins, tigers, pirates, roller coasters and rock n' rollers for pure, raw animal entertainment. While strolling through the park, I heard a noise. Could that be a band playing? Yes. It was part of Great Adventure's "Live And Local" music series. Local bands are featured on outdoor stages throughout the park. I happened to catch a young 5-piece band from Millstone, NJ, Finale Hill. They put on an upbeat show featuring 4 original songs, as well as, 4 cover songs. It was an unexpected bonus set for our musical weekend. 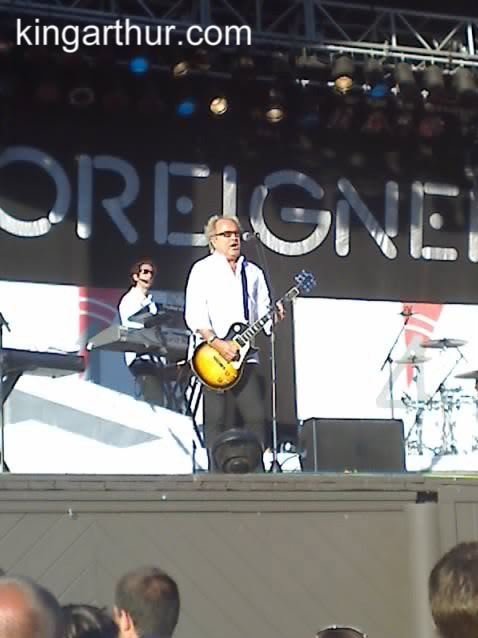 Next on the agenda was DVS, the opening act for Foreigner. They were scheduled to come on stage at 6pm, however; they went on early. So, I only caught their last song, which was a potent cover version of the Rock Band video game favorite -- Coheed And Cambria's Run To The Hills. It would be nice to catch their whole set sometime. 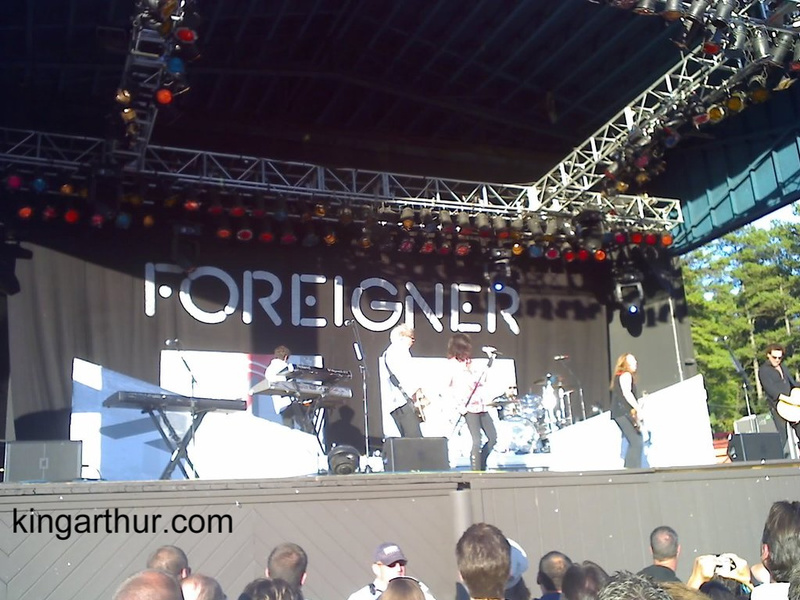 Having reviewed a dozen bands in the last 5 days, I had low expectations for this night's featured performer, Foreigner. After all, there wasn't much of the original band left, and they hadn't a hit in many years. Boy, was I surprised. First of all, I'd never seen Mick Jones play live. 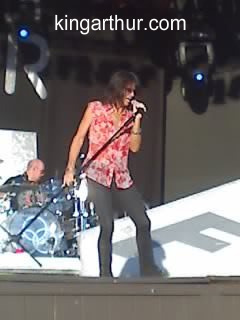 What a fabulous guitar player he is! 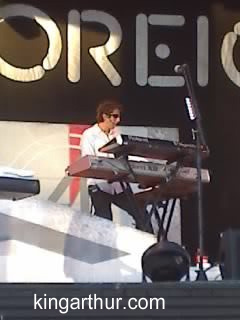 He can sing and play keyboards, too. Second, it wasn't just old folks in the audience. We happened to be standing next to a group of wild eyed youngsters. Since almost every song was a familiar radio standard, it made it easy to jump and sing to one hit after another. Third, I had forgotten about the replacement rhythm section. On drums was Jason Bonham. Not only is he the son of the legendary Led Zeppelin drummer, John Bonhamm, but he is also a sensational drummer in his own right. I'd seen Jason twice before. 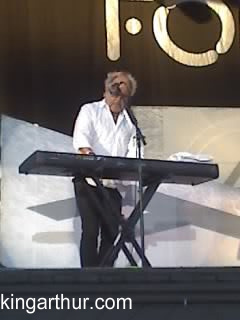 The first time I saw him was his solo tour in support of the album The Disregard of Timekeeping and the hit single, "Wait for You." The other time I'd seen him was as the drummer for the reformed band UFO. In both instances, his ability as a time keeper and power drummer stood out. Couple him with the bassist from Dokken and Dio, Jeff Pilson, and you have a rollicking good time. Some parts of the show that really stood out included: a powerful version of Starrider plus Thom's flute playing; Mick's banter with the crowd throughout the show; Jason's drum solo with some Zeppelin bits going into an extended Juke Box Hero with more Zeppelin out-takes; the encore of a fearsome Long Way From Home, the crowd embracing and swaying to I Want To Know What Love Is, and finishing with a crowd screaming along to Hot Blooded.